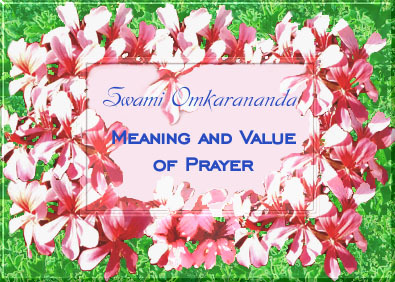 May this little booklet enshrining as it does a speech of Swami Omkarananda, on the meaning and value of prayer, cause in the public a vigorous enthusiasm for a deeper study and understanding of the phenomenon, and the immense value, of prayer for the daily life of work, progress, peace, happiness and spiritual development. Prayer is a mode of talking with God, a way of walking with God, and an act of living in God. Prayer is a way of communing with the absolute Beauty and Power that God is. It consists in elevating our whole being and granting it an experience of the Divine Consciousness. It is a kind of fellowship with God. The real prayer is an inner state of exalted and transformed Consciousness in which we realise our intimate and dynamic relations with the infinite Light and Love that the divine Being is. The finite needs the unbroken support from the Infinite. The limitations and the suffering of the finite arise from its lack of the knowledge of the Infinite that is enshrined in its own inner essence. Man cannot subsist without the Life of Life that God is, and has no real Peace, Power, Joy and Perfection without a conscious realization of the endless creative possibilities of that Life of Life. The Infinite is the strength of the finite. If you wish to remain unassailed by anything, and be a Power in yourself, a strength that cannot be shattered, consciously recover and experience your inner identity with the Infinite. The lasting joy that the human heart longs for, can be had only in the imperishable and unlimited Being. That Being is within the inner centre of the heart, and the heart can establish intimate relations with It, by prayer and by meditation which is a profound form of prayer. The Infinite alone is Delight. Joy resides in that which is absolute and unconditioned. Human pleasure is fleeting. It requires much exertion in getting it. While we have it, it wears out our nerves, depletes our energies, and adds age and weakness. When it leaves us, it causes in us emptiness and pain, and enslaves us to a dreadful craving for a recapture of its eluding self. Therefore, the wisdom of experience in you says, "Seek the Infinite, for that alone is Joy unlimited, imperishable, unfailing, self-sustaining, unconditioned, timeless". When you have this Joy, human life becomes a paradise, the Delights of Heaven are secured for you, the Light, the Grace, the Power, the Perfections of that which is highest in your inner Consciousness, appear in your everyday outer life. The touch of the timeless Godhead is essential in order that we may work, with strength, in this world of time. It is inevitable that the human individual, conditioned as he is in limitations, should touch this absolute Power, Peace and Joy, or be touched by it in one way or the other. Otherwise he is bound to be shattered by his own limitations. Prayer is the greatest need of the soul in us. It is a tremendous power that alone can break all the human chains and bondages. Man, as he is, is a finite individual, exposed from every side to many forms of weakness, misery, trial and tragedy. Man is never safe on earth. The only way out for him is somehow to touch the Infinite, somehow to associate himself with this absolute divine Consciousness, somehow to call upon this Godhead within him, around him, everywhere, somehow to attune himself with the Infinite, - and that "somehow" is prayer in any of its numerous and profound forms. Prayer is something that intimately binds us to the vastness, the power, the nature, the grandeur of Godhead. Our prayer, if it is to be real, should be successful, profitable; something that touches the Divine, something that exposes our being to the influence and pressure of the Divine. Every prayer must be a kind of spiritual experience; and therefore we have to go to God with a heart full of love, trust, confidence, with a self that is surrendered to His omnipotent and all-loving Will, with a nature that is submitted to His transforming Grace. Every prayer should mean to us an act in which we are influenced by God"s Power, moved by God's Grace, acted upon by God's Presence. Every prayer should bring about some change in our thoughts, some expansion in our feelings and effectuate some transmutation of our gross nature. An effective prayer, a true prayer, is a prayer that proceeds from the deepest energies of the human emotion of love, a prayer in which the whole inner being of a human individual rises as a single flame and touches God"s Presence and Consciousness. The only essential condition in any fruitful prayer is that in it our heart should have touched God, and our inner being should have been influenced by Him. If, in any prayer, there is not this touch of divine Grace, this all-absorbing and all-overwhelming experience and feeling of being with God, the influence on us of the divine Presence, our prayer is neither really powerful nor really fruitful. However, just because we do not have any overwhelming experience of God in all our prayers, and have not arrived at this high state of inner development, we should not desist from praying. We can start right from the beginning, and thus prepare ourselves for the highest states and conditions in which we have an immediate experience of God. Any beginning of any nature and type is itself a valuable achievement. Whether it is St. Francis of Assisi or any other great saint of the world, that person would not have been made a saint by the very first prayer. The prayer has to be kept up day after day. One has to pray hundreds of times, millions of times before one could find oneself a saint. It is not by just a few prayers that we draw into our nature and daily conduct, something of the Light and Character of God"s Being. It does not matter for what reason we had gone in prayer to God. When we come back from prayer, we must come back with a peace that does not belong to this world, with a heart that forgives everything, with a being that is full of a rare inner Strength, a rare inner Joy. We are to return from prayer, with an ability that meets the situations of life in a way other than the human. When Jesus could always depend upon prayer for recharging himself with spiritual power, how much more is prayer a necessity with us? For better behaviour, for peace of mind, for a better vision and perspective of life, for strength to meet difficult situations, for a hundred such things, we need the aid of prayer. The power and resources given us by education, by wealth, by culture, by a hundred worldly assets, are inadequate. They fail us in moments of trial. Prayer alone seems to come to our rescue. Therefore, to the problems of life, it is not education, not wealth, not the superficial culture, not comforts, hospitals, asylums, prisons, that are the real and central solution. To the problem of life, there is only one solution: conscious experience of God. The vision, the knowledge, the realization of the Infinite is the only solution. Since the birth of humanity on earth, prayer alone has been the force which has structured all saintliness around the world. For inner spiritual evolution, for growth of men into Godhead, humanity has utilised prayer. It is not merely for answering the demands of an evolutionary nature in us that prayer has been resorted to, down through the centuries, by all humanity, but for every purpose in human life. Men and women of heart-breaking misery and unhappiness, women in the crucible of suffering, people faced with disasters, have all found from prayer the needed relief. Prayer has been something essential to human life, since the creation of mankind. Human life discloses to us so many situations, so many conditions to all of which prayer alone seems to be the one real answer. Life raises many fundamental problems which cannot be answered in any other way save through prayer. Even the most sceptical medical men, when confronted with cases which are incurable, have felt the persuasion for resorting to prayer. And in many cases where the right prayer was offered, the healing was effected by prayer. There are hundreds of doctors around the world today, who are convinced of the power of prayer. They have evidences of the way the power of prayer works, in cases which are pronounced by them as hopeless and incurable. A famous Nobel Prize medical man, Alexis Carrel, pronounces a bold statement on the foundation of his personal experience in many hospitals in Europe, in England and in America, that doctors, in future, will resort to prayer. Not only in the field of human suffering, misery, and diseases, but in all fields of human experience, we find the importance and value of resorting to prayer. It is a conceit in human nature to think that prayer is a mode of demeaning ourselves before another person, before someone called God. It is no such thing, for God is not a person external to you. He is the Kingdom within you, around you, everywhere. He is infinite divine Consciousness and Presence. He is omnipotent, absolute Knowledge, absolute Delight, absolute Light and Peace. Man is like a drop and God is the ocean. If, in self-conceit, the drop isolates itself from the ocean, if in its egoism it seeks to remain apart and separate from the ocean, it perpetually lives under the threat of being dried up. But, the moment the drop sinks into the ocean, it at once acquires the illimitable strength of the ocean, the proportions of the ocean. It acquires all the properties of the ocean, all the vastness and grandeur of the ocean. The moment man, through the power of prayer, sinks into the ocean of God-consciousness, he becomes a superhuman individual, he grows conscious of the infinite strength and power and vastness of the inner Consciousness. It is then that he is intensely aware of his intimate relation with the Godhead, the Father in Heaven. It is from then on, that his attempt at being as perfect as the Father in Heaven begins. Prayer, therefore, is something that is required of us, not by superstition, not by a blind belief, not so much by the religion into which we are born, not even so much by the very trials we face and encounter in daily life, but by the very nature of our inner being. Whether it be for worldly welfare, happiness and prosperity or for inner spiritual enrichment, illumination and fulfilment, we have to get back to the infinite Source, the infinite and all-marvellous Power of God-Consciousness. Therefore, no man on earth can claim with impunity, freedom from the need for prayer. Prayer is a wonderful art of growing into Godhead. It is a magnificent process of transforming ourselves into divine Nature. Since in the condition of prayer the whole mind, heart and soul of man rises as a single, many-sided power, and senses, feels, knows, experiences the Divine, we should say that prayer transforms human emotions, exalts all that is divine in our inner being, liberates us from human limitations, and leads us into a world of indescribable peace, joy, strength, knowledge, light and creative consciousness. There is no such thing as the phenomenon of saintliness without the essential element of prayer. Even the life of Jesus Christ and of all the prophets has been ensouled by the power of prayer. How many times had not Jesus to pray in order that he may constantly draw his superhuman energies from the Father in Heaven? There are however many forms of prayer. Each individual soul has his own peculiar way of approach to the Divine. If you look at the lives of the prophets of the Old Testament, or study the lives of the Psalmists, or the lives of great saints of the world, you find different ways of praying. But all that is essential in any effective prayer is not necessarily the manner and mode, but the spirit in it. From the simple mode of addressing God in our daily life, to highest conditions of inner being, where the human individual offers himself up entirely to the Divine, in total self-surrender to the infinite Godhead, there are several hundred forms of prayer. So, as required by our inner needs, and in consonance with our inner equipment, our understanding, our faith, we can strike our own path of prayer. There is the prayer of the heart. There is a mental prayer. There is an oral prayer. There are many forms of prayer. Some prayers go by the name of meditation. The prayer of a man of knowledge consists of a constant and continuous awareness that God is immanent in all the universe, that God is the basis and the background of all that is manifested and existent. Therefore, the wise man, the man of superior knowledge, the man of divine Knowledge, prays by way of his continued inner mental awareness of God everywhere. In all that is limited, he is conscious of the Unlimited. In all that is changing, he perceives the Unchanging. In all that is perishing, he discovers the Imperishable. He knows that every moment of time is being supported by the Timeless. He penetrates into the phenomenon of life and discovers therein the seeds of the immortal Life. This is his prayer, this form of reflection, this type of dynamic and operative knowledge. That wise man whose intelligence touches the infinite and the absolute Principle wherever it is operating, can be best described as a man of prayer. There are hundreds of men and women in the world who do not possess any learned form of prayer, but whose hearts are constantly feeling, seeing, experiencing a divine Presence. Their Prayer consists of a mute sensing and experiencing of the divine Presence. Among the forms of prayer, there are some prayers which confine themselves exclusively to asking God for worldly gifts. There is nothing wrong in such an approach to the Divine. Every child of God, everyone born on earth, has a right to ask from God, everything that is essential for a happy life, for a progressive life, for an evolving life. We can go to God even for worldly gifts. But it would be wisdom on our part to go to God for Grace, for Light, for Knowledge, for more Faith. Because we know from our experience in life, that though we have all the gifts, all the essentials of life, all that we think is necessary and needed for a decent and happy, comfortable life, yet we are unhappy, peaceless, full of unrest, discontent and trouble. Therefore, there is not much wisdom in asking from God just the things which, even if we have in great abundance, would never yield us any real peace and happiness. Also, either way, God has already granted, and is granting, unasked, all that we need for the comfort and happiness of life on earth. Real love for God, a little higher knowledge, would compel us to go to God, in prayer, not for any of the worldly gifts, but for more of light, more of inner strength to face the challenges and circumstances of life. It would persuade us to pray in order that we might do His Will, in order that His Wisdom might prevail in our lives. Let us ask from God goods that neither science nor technology, neither wealth nor any resource in our great modern civilization, can ever give us. What are those goods? They are wisdom, grace, peace, inner growth, more faith, more love, more spiritual sensitiveness, more of an exaltation of the inner consciousness and nature, a stronger attachment to God, a greater fire of spiritual aspiration, a deeper hunger for His Kingdom, a greater Light for dispelling many forms of ignorance in our mind and soul. Let us pray also for freedom from human limitations, for liberation of our being from the nature which subjects us to weaknesses. These are the gifts we have to ask from God. It is for these we have to pray. When circumstances of life require of us that we should seek from God a gift of health, or freedom from sufferings for a person who is suffering excruciatingly, or for establishing harmony or peace in our relations with others, - all such asking is legitimate and will be answered by God. Now, we have considered what to pray for, let us ask ourselves when to pray. All of us can pray a thousand times during the day, provided, during the day, a thousand times, something in our heart and mind is conscious of the divine Presence, experiences that Presence, thanks that Presence and feels strong, peaceful and happy in that Presence. The Bible also recommends unceasing prayer. St. Paul says: "Pray without ceasing." Any time is prayer time. If we know the art of tuning ourselves with God"s all-pervading Consciousness, we find every minute is prayer time. We can pray to God also through our work, through all actions, through our profession, through our daily life. There is nothing so powerful to hasten our evolution, as prayer. Prayer not only releases our nervous tensions, grants us peace of mind, a hopeful spirit, a dignified behaviour, but also transforms the substances in the subconscious and the unconscious. It is a crucible in which we are purified, refined and rendered gold. Prayer also invests us with an infinite dignity. Any deep real prayer makes us suddenly conscious of our divine origins, and links us to the all-seeing, all-wonderful Light that God is. It is as though the diamond suddenly recovered a knowledge that it is a diamond and not the coal it has always been thinking itself to be. In prayer, when we close our eyes, shut ourselves out from distractions of the external world, and turn our mind, attention, consciousness towards the Divine, the mirror of our inner being reflects the infinitude, the colours and the qualities of God. When we come back into everyday activities, we perform these activities with a grand divine Vision, with a divine perspective on life, and always with the glorious knowledge of God in the background. When we turn the surface of a tiny mirror towards a mountain, it mirrors the whole of that mountain, however broad or high it may be. In the same way, when the mirror of our mind or our inner being is turned towards the Infinite, the Absolute, the immeasurable Godhead, it must and does reflect the Nature of the Divine. A constant reflection upon the attributes of God, a constant inner preoccupation with the attributes of that infinite Consciousness, a constant and unbroken activity of heart"s devotion, to the all-loveable and all-loving God, will make us God-like. When we are God-like, we have power which can never be affected by any power in the world. We have a light which cannot be dimmed by any form of darkness or ignorance, and many things that are impossible for ordinary human beings, are possible for us. Living in this world of disease, suffering and limitations, and death, we will yet be enjoying the pleasures, the freedom, the peace of the Kingdom of Heaven.